I want to thank you for viewing our website and take a moment to share a little background about my company with you. Glass has always been my passion. From the time I was a small girl growing up in Iowa viewing the world through the stained glass windows in my grandfather’s home I felt drawn to the art form. In honor of those childhood memories, I named my company J. Devlin Glass Art after my beloved grandfather. In the early years my hobby and fascination grew into a stained glass studio with a focus on creating leaded glass windows and lamps for homes, churches, and businesses throughout the Midwest. Today, in Lincoln, Nebraska, I design an extensive line of home décor items that are handcrafted and produced in China by a world-leading manufacturer of stained glass. Not only does this company consistently produce quality product, they also have the morale agenda I greatly admire, which is to help the handicapped, orphaned, and less fortunate of their country. 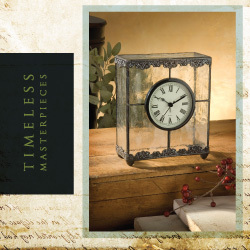 My designs today have resulted in a broad and unique line of items including picture frames, floor lamps, table lamps, keepsake boxes, clocks, ornaments, kaleidoscopes, trays, and vases. The classic designs incorporated in my picture frames are enhanced with photographs from a bygone era right from the family albums. They include photos of my mother and her family. This is an art form from the past that I hope everyone enjoys today!